Two of My Birdie Babies Are Looking for a Home! Would anyone (ideally in Los Angeles Metro, SoCal, or day-road-trip distance from Los Angeles) like two green cheek conures? For those who don’t know, in June of 2018 my female cinnamon green cheek conure (GCC) and my male yellow-sided GCC decided to lay some eggs. 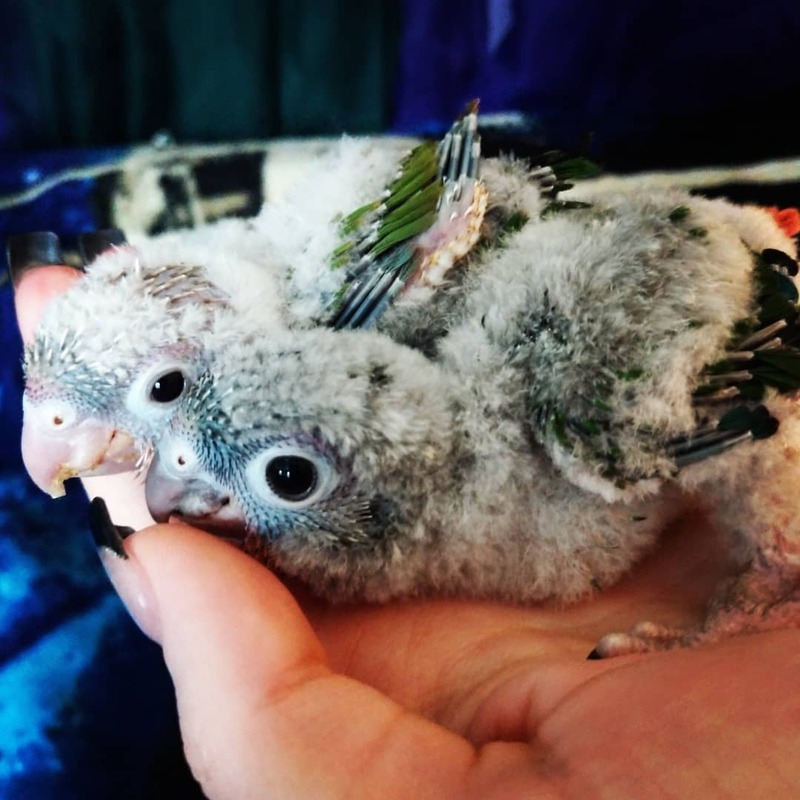 We got 2 babies from the clutch, and I co-raised them with their parents (so they aren’t exclusively hand-raised babies, their parents were very doting). The proud (and protective) parents with their new hatchlings. Friday and Sunday are both female, they’re about eight months old now (they hatched in early July 2018). Friday is two days older than Sunday. They’re pretty used to their names, though those names were originally placeholders (the days of their hatchings) until new names came along, but they’ve really grown into them. They adore each other, and I don’t wish to separate them. They’re a little shy, but they don’t really bite (unless scared). Friday is a yellow-sided (she’s the one with the black beak), Sunday is a pineapple (she’s the one with the pink beak). Friday is a little more anxious than Sunday is. Sunday’s very good about stepping up. They’ll both happily sit on shoulders. They are both very silly and LOVE to play with their toys. They are fine with mature children who know how to be calm around them. They both do zany things like run around the top of their cages upside down and hang by a single foot while eating a treat. They aren’t currently flighted – they had their wings clipped after some bird-meets-mirror mishaps of flight. I bring them to a groomer for nail clipping and wing clipping (though I’ve only had to do the wings once, since they’re under a year old). For non-bird people, wing-clipping doesn’t hurt them and is temporary. It’s useful for training, and the feathers grow back with a molt. There are pros and cons to clipping, and I can talk to you about them too. They generally sleep when it’s dark, ideally 10-12 hours. In my house, I cover them from 10pm to 10am, and they get plenty of sunshine from the nearby window. They are pretty adaptable to their human’s schedule (they did a trial period with a friend of mine, they were basically up 8am-8pm). They are quiet when it’s bedtime, and tend to be chirpy with the sun. These birds have an average lifespan of 20-30 years. Why don’t I want to keep them? Also, about me in case you’re here from a share, rather than a direct friend: Hi, I’m Avens, I’ve been keeping birds since I was about 6 years old, so it’s 25 years of bird-keeping. I love small parrots, almost all of my birds have been rescues (one of my birds was left to me in a will, actually), and breeding parrots isn’t really my thing. But I do love birdies – I’ve had 17 birds total, not including birds I’ve fostered. I really didn’t want baby birds. Breeding my GCC pair was an accident, and I’ve been discouraging it from happening again. 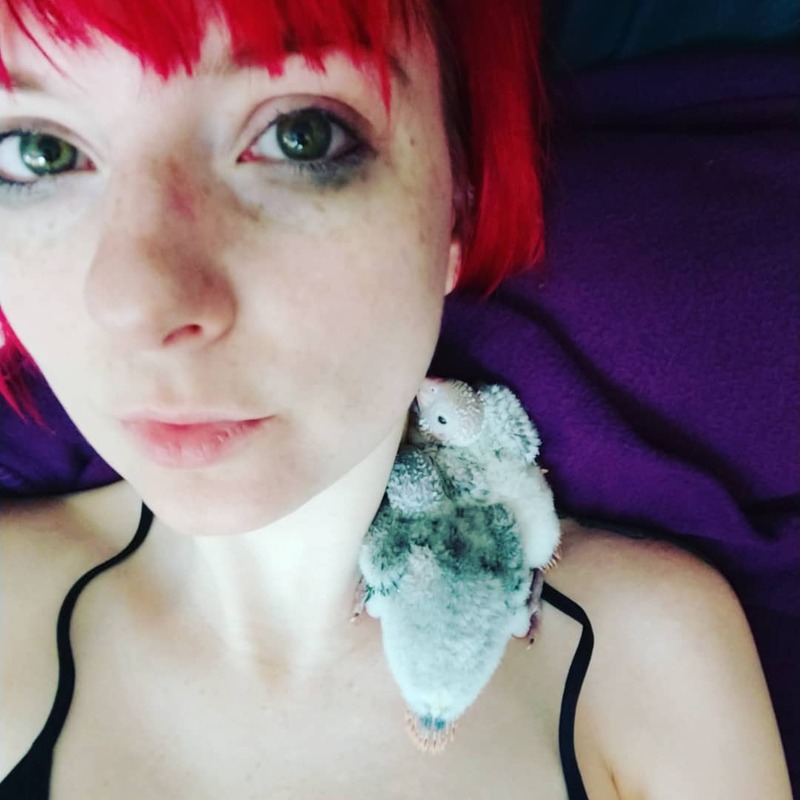 I have two older (22 years old) parrots who require a lot of attention, and a disabled GCC who is solo and completely bonded to me (who is basically glued to my shoulder half the day). I don’t really want this many birds, and I always intended to find the babies a new home once they’d hatched. I’m open to people who already have birds, who have had birds in the past, or people who have never had birds but are interested in learning. I don’t want these girls bred, so please ***no breeders*** who want to match them up. I do want them to stay together. I am completely fine with adopting them to someone with the understanding that if it doesn’t work I take them back and find them a new home – so trial runs are completely fine by me. Ideally, a 30 day or 90 day (obviously distance is a factor). I don’t need to be uprooting them weekly. They did a 40 day trial recently in a home with a 7 year old child and a dog. It didn’t work out, though the child is quite attached, so anyone who ends up taking them we’d appreciate pictures and videos periodically so she can see them, and maybe even visit them someday (if local). I’d like to find them a home with a friend (or a friend of a friend) or someone I can stay in touch with. IF for some reason after a few months or years or whatever, something happens and you can’t keep them, I would always rather take them back and find them a new home instead of seeing them go to a rescue. I will be interested in their well-being for the rest of their lives and mine. If you have a dog or a cat already, I’d like to discuss their temperament. Some animals do fine with birds and some don’t. Some people don’t want to commit because they worry that they need to spend all day with the birds. I’ll be honest – having a bonded pair like this has some distinctive pros and cons — the bad news is, they love each other more than they love you, and though they can be friendly and tame, the most important person in their lives is each other. The good news, if you have to work or school or whatever, they’ll amuse themselves all day while you’re gone. As with all birds – the more time you spend with them, the more they’ll be friendly and bond with you. Is this a rehome or a sale? Green cheeks in pet stores go for a couple hundred dollars (~$300). I paid $45 each for their DNA blood tests, so I guess it would be nice to get $50 each, but I care more about a good home than the money. I also have about $150 worth of cage and toys and things for them. In an ideal world, you’d take the birds, see how it works out, and if you want to keep them, I’d get $200 (total, not each) for compensation of their DNA tests and their cage/toys cost. HOWEVER I really just want them to go to a good home, so that’s not only negotiable, please don’t consider it a barrier if everything else lines up great except money. 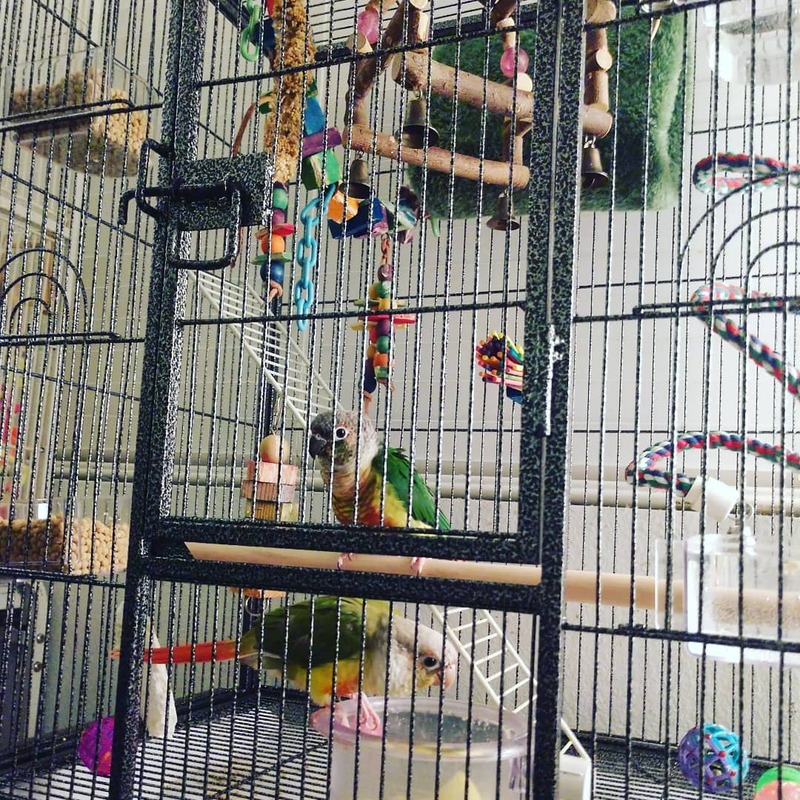 They have a cage they like quite a bit (details on Amazon, it’s the 53″, and is listed $10 cheaper than when I bought it! ), and lots of toys. They would come with that. I have a list of their favorite foods and treats and Amazon links to where I get everything. I’d basically give them to someone with a “first supply” of what they need for roughly a month of care, and info on where to buy refills. They do like to chew up their toys, so they’ll need new ones periodically (again, I have Amazon links and store recommendations). If you are interested, feel free to private message me on Facebook (or email avens.obrienATgmailDOTcom) . Messaging me does not equal a commitment, we can totally chat about whether it would work for your lifestyle, what regular costs are for living with birds. I’d like to know who might be interested especially if one situation doesn’t work out, so there are other options. I’d love to find them a new home in April if possible, but will hold onto them until I find the right one. As I said, I’d ideally like someone reasonably local to LA, however, if you’re within a one day road trip from Los Angeles (like Phoenix, Las Vegas, San Francisco) I would definitely consider it. If I can drive there in a day, settle the birds, and drive home the next day, that’s about as far as I want to bring them (I may ask for gas money). I *will not* ship them, fly them on an airplane, or anything like that. If *you* live further and you desperately want to road trip to get them, we can talk. I’ll update this post at the top if and when I find them a home. So if there’s no notice at the top saying otherwise, feel free to send me a message about them!